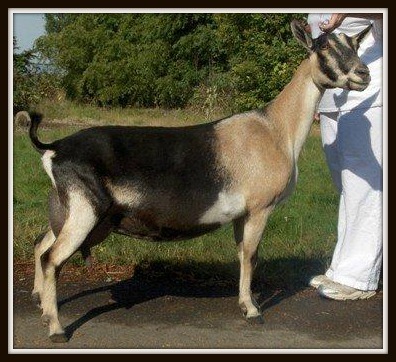 Please visit Tsit-A'-Gi Dairy Goats for information on our newest line up of Alpine Sires. SEQUOIA WOOD CC SABATHIA *B AA1599185 is our number one Alpine sire. He is the son of LEAP'N-LEABO RAINMAN SPLASH 2*M AA1254495 Ex91 and HARMODY JN CANTATA'S CRESCENDO *B AA1558154 a son of HARMODY R BRIA CANTATA 8*M AA1386483, the 2010 ADGA Nat' l Reserve Grand Champion as well as Reserve Best Udder in 2010 and 2011. Sebathia came to us from the Sequoia Wood Farm in Albany, OR. We are expecting this handsome buck to be a grand slam winner in bringing these outstanding genetics into our breeding program and looking forward another fine kid crop in 2016. Sabathia has earned his own accolades on the tarmac by repeating his 2014 home-run by winning first place in all four rings at the SMDGA 2015 Fall Frenzy Buck Show and earning his second leg. I would like to thank Teri and Skip Hamilton, the breeders of this fine buck, for making it possible for him to join our herd and for letting us use their photos and information about his dam and sire in our presentation of Sabathia. For Sale: for details please contact us at: goatburper@yahoo.com. Sabathia's dam, Splash, pictured in 2009 as a 6 year old. She is not only a beautiful doe but very productive and produced at 13.1 lbs of milk on her 6-4-12 DHIR test for the Hamiltons as a 9 year old mature doe. Tsit-A'-Gi My Doe-A-Dear milking Sabathia daughter. Te-Iltcohe Hilarious Fiodadh, milking daughter of Sabathia,in her working cloths with 12 hours milk and 18 months in milk. 2017 Sabathia daughter, Te-Iltcohe Sabathia's Narya, owned by Lila Greystone of Pemona, Mo. "Entropy" our 2013 National's Sabathia girl. 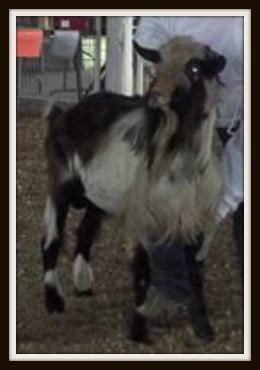 Shining-Moon Xrated Enterprize has truly brought the superior genetics into our herd that we were expecting from him. 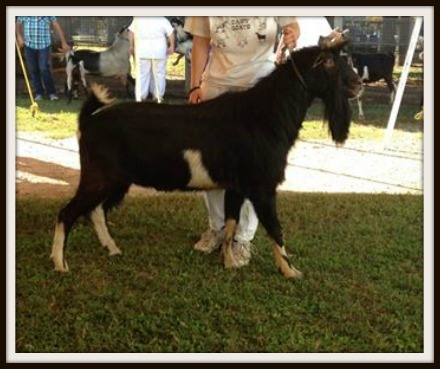 His 2015 kid crop has already had some great results in the show ring where recently his daughters brought home the 1st place Jr. get of sire from the 2015 Tri-County Fair in Mountain Grove, Mo., due to their uniformity of rump angle and smoothness in the shoulders, as well as a 1st intermediate doeling, 2nd, and 3rd place senior doe kids. 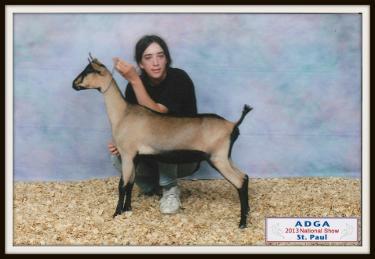 His 1st place intermediate doe kid was also the Jr. Reserve Alpine Champion. We are not only looking forward to continuing success for these girls throughout 2015's show season but are looking forward to what they will bring to the pail in the future. Enterprize is a son of Shining-Moon X-Rated and Shining-Moon Blase' Dancer. Pictured above is Enterprize's elegant dam "Blase". A big thank you to Micki Colfax of Shining-Moon Ranch for the use of this photo. Please visit their Facebook farm page to learn more about their exceptional and beautiful Alpines. 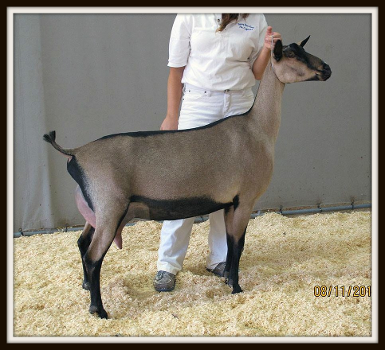 New to our Alpine sire lineup is Iron-Rod Staubach Sir Legacy. He recently came to us, toward the end of 2014's rhut, from Panther-Creek-Farm. This handsome son of Iron-Rod Rhett Staubach is a purebred French Alpine and brings Iron-Rod's high quality French genetics into our breeding program.